£130 Sat Nav That Looks A Right Bargain, But Is it? 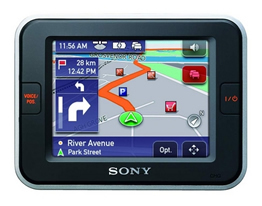 If you look in the right places you can actually pick up the Sony NV-U52 in car Sat Nav for under £100 at the moment. That's right, a full Post-Code, 3d maps, touchscreen Satellite Navigation device for less than a hundred notes! Bargain! Before we get too carried away lets take a look at this little beauty. The specification seems ok, with maps of GB, Eire, Northern France and a plentiful supply of POI's. 3.5" Touch screen, a rather unusual windscreen mount, and the ability to accept Speed Camera POI's, although none are included. This will, of course be a paid subscription. Turning the unit on we can see why this unit is cheaper than it's main rival from Garmin and TomTom. Although the menus move around and slide in and out quite prettily, its old a bit slow and last-year. Everything seems to work nicely, but it's not as easy to use as the GUI on a TomTom, Navman or Garmin, but I guess at this price we can't expect everything. Plugging it into the car and going for a quick spin the unit seemed to work ok. Voice instructions could have done with being a little louder, but the screen was bright enough. What stopped me was when I saw a POI that shouldn't have been there. On the screen was an icon for a cinema that had been knocked down ten years ago. Oh dear. Despite this I have to say that if you've only got a hundred notes to spend, the Sony NV-U52 is an option. But I would have to try and get you to spend a little more and get a Navman S30, Garmin Nuvi 200 or TomTom One. They are much, much better units and about £50 more, it would be money well spent. In conclusion, if money is really tight then the Sony would be an ok buy, but if you could stretch a little further, please go for a Garmin or TomTom.